There’s no better feeling than finally completing your work, and getting it ready for the print out. It gets people excited to see their work, whether it’s personal or professional; whether it’s a photo or document; whether it’s black and white or color, getting printed at last. At this moment, nothing can ruin the feeling except a pop up message that says ‘Printer Not Detected’. The situation gets even worse especially when you’re in your final moments, and you really need to get your last minute print out, and the same message appears. In this post, we will show you how to fix that error and how to Download Epson Printer Drivers for Mac? Epson Printers by Seiko Epson Corporation are really award winning fast and durable printers. It offers a lot of extra features including quick scan to PC, online Printing from email and much more. All the exclusive features are available in almost all types of Epson printers such as Monochrome laser, Laser Printers, Color Inkjet, laser, multi functional laser printers and other types of bigger printers for offices, manufactured by Epson. One of the best feature of Epson Printers are that the are very easy to setup and install and work like wonder as the driver mostly gets installed as soon as the printer is plugged into the Mac. Even Microsoft Windows downloads its driver automatically from windows update. But sometimes the driver is not downloaded correctly or is not applied for the right model, in such cases, you need to set up the driver manually. In this post we will first show you how to download the Epson Printer Drivers for Mac and then how to install it correctly to make most of it. Also we will focus on different issue that arises while downloading the Epson printer driver for Mac. So here are the agenda for this post. What are the normal issue while Downloading and Installing Epson Printer Driver on Mac? Epson printers are known for its quality and has been winning excellence quality and service award for years. It was always good with drivers too and was never a problem for installing its driver on Mac until Apple released new Mac OS X ver. 10.11 El Capitan. Apple made some changes to the way drivers are installed by making drivers for almost all the manufacturer go through its download server. And all the drivers are automatically installed as software update upon plugging the printers to Mac. After this updates, Printers manufacturers like Canon, Epson, HP, Kodak, Lexmark and others also stopped serving the Printer driver download for Mac from their server and redirected their user to download the driver from Apple’s server. That’s why we are focusing this post of Mac users who are using Epson printers and do not have the driver installed or the driver is not setup correctly for the right printer model. After reading this post you will be able to Download the full featured driver for Epson printer on Mac. Also here is the list of available printer’s model whose drivers are included in the download file. The list was updated recently and Apple keeps updating it as the vendor make the driver for new model available. Also i would recommend you to check your Mac for any software related updates before connecting your printer to Mac and also check for updates after you have connected the printers. Here is how you can check for updates. Simply Open App Store and make sure your Mac is connected to a reliable internet connection. Click on the update icon at the top right of app store window. Wait until the Mac checks for update. If you see any update available, select update all button and restart the computer when it asks. If your printer support AirPrint, you may also install the AirPrint driver which is just done by selecting the option for AirPrint during the driver installation. The problem might arise due to various reasons, one of which is Driver related, i.e. either the device Driver is outdated, and needs to be updated, or, your computer doesn’t have the Driver installed. No matter the situation, the only solution that you’re left with is to download and install the latest Driver that supports your printer. Now, there are various brands of printers and operating systems out there, and you could be using any one of them. This blog, however, is focused on Epson Printers and Mac Operating System, i.e. a large amount of information offered in the blog is exclusive to the two brands. Despite all this, there are certain general information that could help you have an overall idea about drivers and how to download them, no matter what printer or operating system you’re using. So, don’t give up yet. Continue reading till the end, as we give you all the information about how to download Epson Printer Drivers for Mac. Here is the direct link to download the latest Epson printer driver for Mac. It contains the driver for almost all the Epson Printer Model. Seiko Epson Corporation, or as it is known simply as Epson, is an electronics company based in Suwa, Japan. It was founded in 1942 as Daiwa Kogyo Ltd. Epson is one of the world’s largest manufacturers and distributors of printers. It also offers products such as, projectors, scanners, desktop computers, televisions, laptops, and so on. The company has a great history with printers. As a matter of fact, Epson was the first company in the world to manufacture mini printer, EP-101. With time, Epson has evolved as a company, and has updated its products to meet the latest demands of the customers. Epson Printers are the most preferred printers in the world because of their brand, as well as the quality that the product offers. The company offers a range of printers, from laser printers to inkjet and dot matrix. You name it, they have it. Their printers are of different sizes and price range, offering multiple features to suit the needs of the customers. Currently, a total of 358 different models of printers are available for purchase. These include the different types mentioned above in colored and black and white modes. To buy them, you could either visit your nearest Epson Center or a retailer selling the product. You could also order the product from various online portals, including that of Epson’s, and the product will be delivered to your doorstep. How and Why to Register the Product? After you get your hands on Epson Printers, or any other product from Epson, it’s important that you register the product. Registering the product ensures that you’re able to receive a host of services, like easy driver updates and technical support, from Epson, which are free for its valued customers. It is quite simple to register your product. All you need to do is follow few easy steps. First, go to Epson’s official website, and click on support. Now, choose the product that you want to register, and click on register the product. You will, then, be asked for your printer’s serial number. Feed all the information, and your device will be registered in no time. If, because of some reason, you’re not able to register your product, you may write to or call their customer support. They will make sure that all your problems are taken care of. Device Drivers in general are programs that assist your operating system to communicate with the device, and control it. Most of the times, drivers are specific to device and model, especially when it comes to printers. And the scenario is quite the same even in case of Epson Printers. You will not be able to operate your printer without the driver, specific to the model, installed on your computer. Now, Epson makes sure that the drivers to all its printer models are widely available to the users, so that they don’t find any difficulty using the device. Let move on to the next part to know ow to Download Epson Printer Drivers for Mac. Downloading Epson Printer Drivers is quite an easy process we have already given link to direct link to Epson printer Diver download. You can do it by following few simple steps. First, go to Epson’s official website, and click on Support option. Now, choose your printer model. After choosing your printer model, various options would appear in front of you, one of which would be Drivers. Click on the plus sign located on the right hand side of Drivers option. Then, a Download button will appear in front of you. Click on it and you’re all set to go. In this way, the driver would automatically get downloaded in the preferred location on your computer. Now, what you need to understand is that the process of downloading the driver is more or less the same no matter what operating system you’re using. The website will automatically detect your operating system, and will offer you the driver accordingly. There are multiple ways through which you can get your hands on Epson Printer Drivers for Mac. But having said that, one thing that you must know about, as a Mac user, is this Apple technology known as Air Print. With Air Print, you can connect your printer to any Apple device, whether it’s iPhone, iPad, or iPod, and print your documents or photos. And the best thing about it is that no additional software or driver is required. The only condition is that the printer that you have must support Air Print. It’s quite an easy process to find out whether your printer supports Air Print or not. Simply go to Apple’s official website, and click on Support. Now, in the search bar, search for latest Epson Printer Drivers. The site will then give you a list of results, one of which would be the link directing you to the Air Print information page. Click on it, and you will be directed to the page where you’ll get all the information about Air Print, including the brand names and models of all the printers that support Air Print. If the name and model of your product is listed on that page then you should be able to print your documents and photos directly. 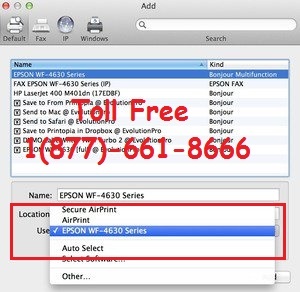 In case you’re not able to, make sure to call Epson Support Service and Download Epson Printer Drivers for Mac. And if the name and model of your device is not mentioned in the list, then, probably it doesn’t support Air Print. You could call Epson Technical Support to be clearer, or get more information, about this. Also, you’ll have to find other, more traditional, ways to download Epson Printer Drivers for your Mac. One of the ways to download Epson Printer Driver for Mac is through the official website of Apple. The process is simple, and can be done by following these steps. Simply open the website, and go on to the support page. On support page, you’ll find a search bar, using which, look for Epson Printer Drivers. The site will then give you a list of results, one of which would be the direct link to the Drivers page. Click on it, and the page with Download Driver option will open. Finally, click on Download button, and the driver will start to download automatically. Apart from the information about Epson Printer Drivers and Mac Operating System, there are a lot of tips here, which you can use to download the driver for your preferred device or operating system. As mentioned above, anytime throughout the process if you find any problem figuring out the way, make sure to call Epson Technical Support. They would make the entire process simple for you. Now, despite the fact that we’re dealing with printers, there’s a huge chance that something could be wrong with Mac instead. So don’t be shy to call them rather, if you have the slightest of doubt that probably the problem is with the computer and not the printer. Both Epson and Apple and world renowned companies that offer great products and services, and so, generally, all these process are designed keeping customers’ comfort in mind. Air Print is a great example of this. Also, to ensure that you get the best performance from both the devices, i.e. your computer and printer, make sure to use the latest versions and models respectively. It goes without saying that the latest versions of their products have more advanced and technically sound features, catering to all the needs and demands of the users. How to Install Epson Printer Driver on Mac? Once you have downloaded the driver, just double click on the driver file to mount the image. Follow the installation wizard if it shows as the steps may vary depending upon the Mac and macOS version installed in your Mac. You will be presented with a list of available printers model whose drivers are available. Choose the Model of your Epson Printer from the list. Now under “Print using” option make sure the correct printer driver or the model of your Epson printer is selected. Just in case the driver is not available on your Mac machine, upon selecting the Printer name in “print using” option the Mac starts downloading its updated driver from Apple’s download server. Once the download is finished and driver is installed. You will see the “Add” button at the bottom right corner of the window highlighted. Click add to finish installing the Epson Printer driver on Mac. If you are using a very old or obsolete model of Epson printer and can not find the name of the printer in the list or Apple could not download and install the printer. You may want to try installing the driver from is Installation CD/DVD disk that came with the printer. With older printer in older times, almost every Printer manufacturer used to provide a installation disk that would contain the printer driver for the model you had purchased. If you have lost the CD/DVD and can not find the driver or for any reason you are unable to download and install the Epson printer for your Mac, don’t worry as we are here to help you. 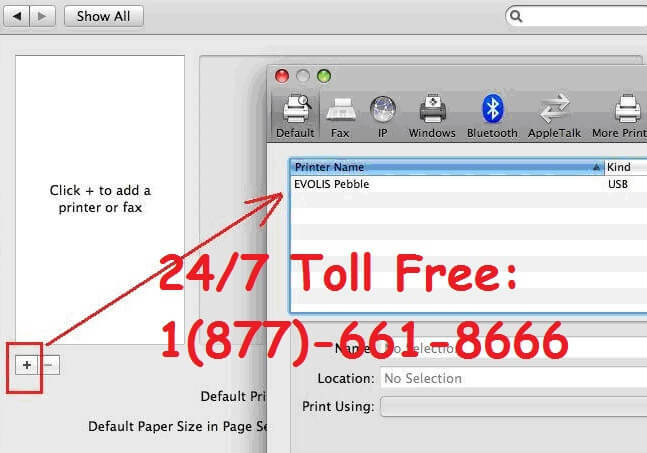 We have a dedicated printer support line who help with all Printer related issue on Mac and Windows. You can call our Epson Printer Support number to get the quick resolution. We provide free diagnosis of your problem and best support and services.